The BBC music show Top Of The Pops had been a mainstay of the television schedules for some time by 1970, and The Beatles appeared five times on it, although all but one was pre-recorded. John Lennon became the first solo Beatle to appear on this show, performing Instant Karma! with the Plastic Ono Band. The live appearance was partly due to Lennon's eagerness to rush-release the single, leaving him little time to film a video. The Plastic Ono Band on this occasion comprised Lennon on vocals and upright piano, Klaus Voormann on bass guitar, Mal Evans on tambourine, Alan White on drums, and Apple employee and future music journalist BP Fallon on bass guitar and tambourine. Yoko Ono crocheted while blindfolded and also held up cards during parts of the song. When John Lennon and Yoko Ono did Instant Karma!, everyone thought Yoko was wearing a napkin over her eyes as a blindfold. It was actually a sanitary towel. Four takes were recorded. Lennon's vocals were live, as was Ono's crocheting, although all other performances were mimed. A special mix omitting one of the song's vocal tracks had been specially prepared the previous day by Geoff Emerick. The appearance was filmed in Studio Eight in BBC Television Centre, London. A camera rehearsal took place from 3.30pm, and the performance, complete with studio audience, was recorded between 7.30 and 10pm. Two performances, takes three and four, were selected for broadcast. Take three, which was later included on the Lennon Legend video collection, showed Lennon and Ono wearing black turtlenecks. BP Fallon played bass guitar and Ono crocheted throughout the song. Take four, meanwhile, had Fallon on tambourine and Ono holding various cue cards with one-word statements: "Smile"; "Peace"; "Love"; "Hope"; "Breathe". 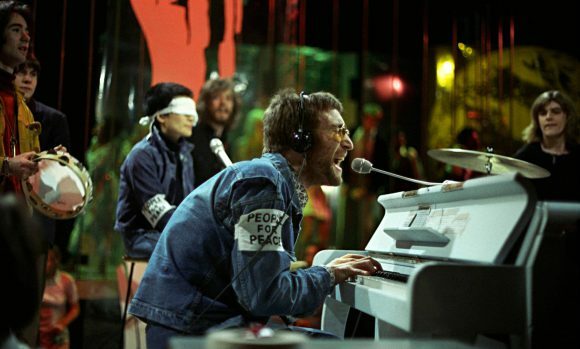 She and Lennon both wore denim jackets with armbands saying "People for peace". Mal Evans was not in this take. Top Of The Pops was broadcast the next night, Thursday 12 February 1970, on BBC 1 from 7.15-8pm, and featured take three of the song. Take four was shown the following week, on 19 February, and take three was shown once again on 5 March. She “CROCHETED” she didn’t knit ! She’s not knitting, she’s crocheting (regardless of what she said on Twitter). She’s clearly using a single hook, not two needles.